Mr. Abdur Raquib was born in Bancharampur, Brahmanbaria on 2nd January 1942 in a noble family. He has been serving as Independent Director and also advising in different strategic and technical issues of The IBN SINA Pharmaceutical Industry Ltd. (IPI) since 2013. 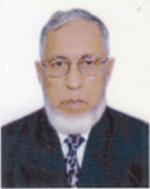 Former Executive President, Islami Bank Bangladesh Limited; Executive Director, Bangladesh Bank; Project Director; Small Enterprises Development Project (SEDP); Director Bangladesh Institute of Bank Management (BIBM), Director, BASIC Bank, Employment Bank, Deputy Managing Director of The IBN SINA Pharmaceutical Industry Ltd.
Professional Education and Experience: Diploma in Association, Institute of Bankers of Pakistan, Overseas Fellow of Economic Development, Institute of World Bank; Financial Programming and Analysis Course, IMF. He completed Masters in Development Economics from Australian National University, Australia, Master in Economics with B.A. (Hons.) in Economics from University of Dhaka.